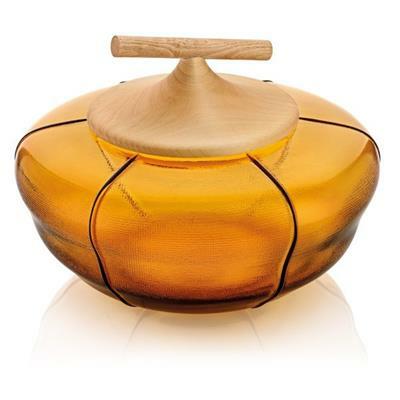 Beehive Jar by IVV. Delicate natural shapes, where irregular forms of the honeycombs transform into embroidery and transparency. Jars inspired by the irregular morphology of bee honeycombs. Soft honey coloured glass shapes of a textured surface suggesting a sensation of natural materiality. These items are completed with a turned elm wood cover that you can hold as if it were a tree branch. Handmade in Italy.